St Johns Way South Shops. Cathys Pink Shop is the last Shop on the left in the Shop units before The Play Barn. Shop Unit 5, St Johns Grove, Johnstown, Naas, Co Kildare. 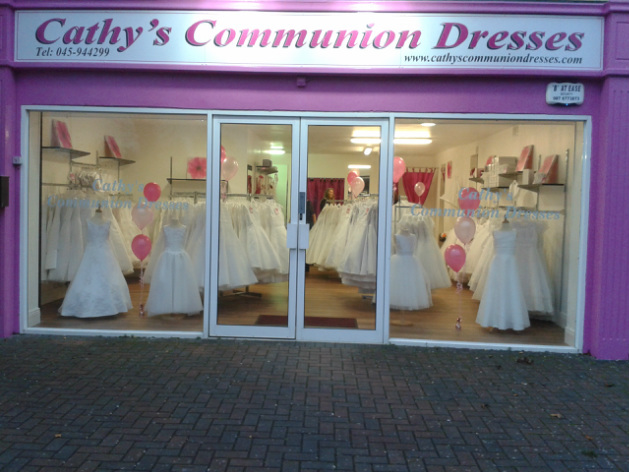 Cathys Communion Dresses Run Communion Dress Sales at Various Locations in Dublin/Leinster. Locations Dublin- City West covers, Tallaght, Lucan, Clondalkin, Rathcoole. Kildare-Naas covers, Blessington, Maynooth, Newbridge, Portlaoise, Kilkenny and Carlow. Wicklow-Bray which covers South Dublin, Shankill Enniskerry, Greystones, Wicklow, Arklow. Dublin North via Ardmore Hotel D11 Covers, Finglas, Glasnevin, Coolock, Whitehall, Phibsborough. City North Hotel will cover Meath/Louth- Drogheda, Balbriggan, Dundalk, Navan, Swords, Rush, Lusk.